to either improve the world or worsen it. you will accomplish one or the other." I woke up at 4:00 A.M. and made myself a cup of coffee, completely dark out still and very quiet. My wife was still asleep for another half hour before we left for the hospital. It was on December 14th, 2012; the most exciting day for the two of us because it was the day we were scheduled for a C-section to have our first child. We arrived at Hartford Hospital in Connecticut on time and by the time we were both in the operating room it was a little before eight. At 8:20 A.M. our beautiful son was born into this world, healthy and perfect in every way possible for two new parents. We were then taken into the recovery room where all three of us waited, there were 17 women being discharged that day so we were going to be there for a while before our room was ready. I walked out to the waiting are to tell the good news to my in-laws, everyone was gathered around the TV, and that’s when I caught the first bit of news. There was another school shooting, one shooter, one person killed. But this was different, it was here in my home state, it was here in Connecticut. Three hours passed before we were finally led to our room, my wife and her parents went to the room while I took my son to the nurse’s station to get his first bath and shot. I was in a state of amazement looking at my son, watching his every movement, not paying attention to the nurses on the phones. Until one spoke up pretty loud stating that something was wrong with the school shooting, ambulances were going out but none of them were coming back with casualties. At that single moment in time my experience of fatherhood was now intertwined with an event that will forever cast a shadow of sadness in my heart. That whole weekend we heard the news of the tragedy of the mass shooting in Newtown, CT at Sandy Hook Elementary school. The loss of 20 beautiful angels and six amazing educators was on every channel, every conversation, and every person’s face we saw wore that same expression of grief. I left for work that Monday and cried the 45 minute commute listening to the radio and hearing the details and all the names of the children. I made it through half the day and went back to the hospital to be with my little family, my little snow globe of joy in this world that was hurting with such a tremendous loss. A few days had passed and I knew in my heart I had to do something, I had to somehow do my part in and help with this senseless tragedy. I thought of the best people that I knew people with huge hearts, people with honor; my brothers and sisters in the jiu jitsu community! I had been training for almost five years and was blue belt and knew quite a lot of people throughout CT and knew they could help me. I called two friends, a graphic designer and the other owned a police tactical store. Together we had 500 patches created for bjj players to put on their gi’s and raise money for the UConn Scholarship Foundation for the victims of Sandy Hook. It started out in CT, I set up a FaceBook page and asked people to post pictures of them wearing the patch. The patch project starting spreading, neighboring states, then Mid-West, and then all the way out to CA . One day when I was managing the page I started chatting with a black belt in OK, Piet Wilhelm. I explained how I appreciated his support, he came back with the idea of him coming out for a charity seminar. I was talking with Piet on my computer and texting my Professor Rob Magao, within an hour we had a flight booked and a date set for him to come to CT.
April of 2013 came fast and Piet came to CT and brought his purple belt Karl Stone and friend Robert Defranco, a third degree black belt from Dallas, TX. Robert Defranco had heard about what we were doing and wanted to be a part of it; he was a father of two and had a very special connection with the tragedy that drove him to help. Between the patches, donations, and seminar we raise almost seven thousand dollars for the foundation. With that project I grew as a person and made connections and some amazing friendships across the country. One of those connections was to a Jennifer Jeffrey Carello who trained in Newtown and was friends with Ian and Nicole Hockley. The Hockley’s lost their youngest son Dylan on that horrible day, and somehow I was drawn to that little boy. Something inside of me hurt when I saw pictures of his little eye’s smiling, his contagious laugh that was transparent even through a stolen moment. During the summer of 2013 I thought of other ways to make an impact, what else could I do to keep helping was always running in my head like a broken tape. I came up with an idea of putting together a bjj super seminar. I would try and get as many black belts on the mat that I could and cram as much jiu jitsu into everyone’s head and donate all the money to Dylan’s Wings of Change, a foundation devoted to children with autism and dedicated to his memory. The foundation's programs are focused on technology, sports, and the arts. Their unique Wingman leadership program creates acceptance and empathy leading to acceptance and inclusion for all. I walked into my school one night to train and tossed my idea out to my professor Rob Magao, he said he would support me in any way he could. I mentioned ideas I had been thinking of and he said one of the most encouraging things, “dream big”! I started texting and sending out messages to black belts I was friends with and immediately got responses of “absolutely, what else can I do”. The weekend of May 18th ,2014 was here in a flash, and together with so much help and support we had ten black belts scheduled to teach for an hour over three days. We had donations from hotel rooms, food, and a ton of gear to raffle off. I had never imagined what this experience would turn into, I never imagined the emotions that would run so deep among so many. 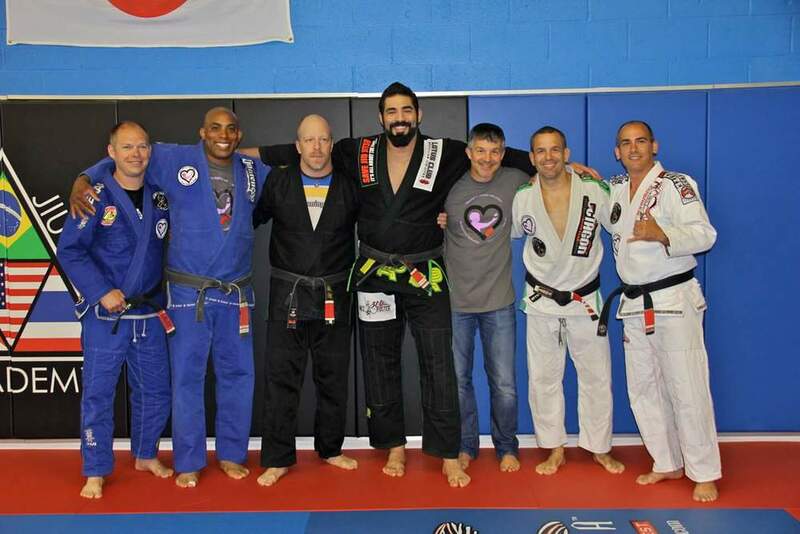 Every day I would introduce the black belts and thank all of them for their time. Every day I would choke up, fight back the tears from the sadness I felt from the tragedy and how proud I was to stand shoulder to shoulder with such amazing people. We had people from across the nation teaching, not only jiu jitsu but life philosophy. Men that were warriors that when talking about their personal account and experience with this event and how it affected them. I watched warriors fight back tears, their invincible armor shed as they were shown as fathers, uncles, teachers, role models, and the amazing caring people they were. That weekend I saw so many of my jiu jitsu brothers and sisters come together for jiu jitsu, for family, for emotional support of each other. I sat and watched all weekend people sharing techniques, sharing stories, and sharing embraces of hugs and love in a way that I had never imagined when I started out on this journey. When it was all said and done, the gym was empty, my jiu jitsu family safe on their way home I sat back and reflected on what had been accomplished and was filled with pride. I was not proud of myself for what I put together, but proud of such an event that I was able to be a part of, proud of the people that I shared the mat with. I couldn’t thank the Blackbelts enough, Piet Wilhelm, Jimmy Kodzis, Rob Magao, Jay Bell, Tony Gioffre, Robert Defranco, Brad Wolfson, James Foster, Dustin Rhodes, and Chris Watson! These men were not only my friends but my mentors and family. In 2015 we geared up for another event, one more time of sharing the mats, sharing our story and making new relationships that would be cherished. I brought some old friends back to teach and had some new black belts come out that would become family. I wasn't sure if we would have the same magic that we had before, and I was right. Blackbelts for Butterflies 2015 was different, it had it's own special magic that drew us all together and share our personal stories. The impact was once again astounding and we touched each others hearts in ways that will last a lifetime. Tim Burrill, Brian Beaury, Anthony Mitchell, Mike Wacker, and Keith Owen joined us and brought amazing jiu-jitsu and the passion to make a difference with them. Bryant Pangelinan and Josh Owen opened themselves up and shared personal stories that impacted everyone. We came to that event with open minds and no politics, we came with the knowledge that this event would do something good but never knew how it would individually impact us. I left with relationships that I will have for my life, I left with more family members than I began with! And now we are here in 2016 with three events ahead of us, we are taking this nation by storm and spreading our message! Through this whole journey there have been so many people to thank and be grateful for. So many people behind the scenes that text encouragement or email for support. They are all just as important as the black belt that teaches, everyone that is a part of this is just as important as the other. But as we focus on the future and the goals we want to accomplish let's not forget why we started. We started this out of pure tragedy, we started this out of pain, we started this because a beautiful little blue eyed boy was taken from us. So no matter where we go, where we are, or what we accomplish. We will always carry in our hearts the beautiful little butterfly that loved to cuddle, make purple dots, and a smile that will never diminish. We will always Roll for Dylan! I have been training under Rob Magao for the last six years. 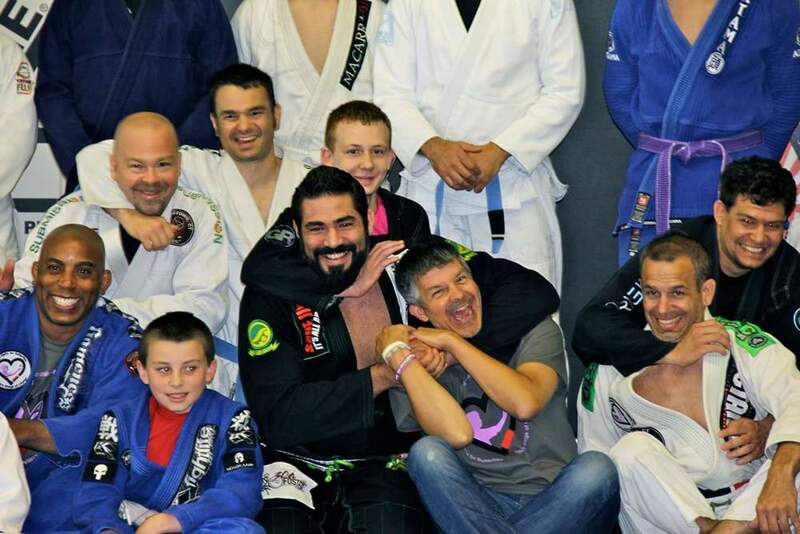 Rob's support and guidance on and off the mat has been invaluable on my journey. This has been an amazing journey and without the support of amazing people we wouldn't be where we are today. Piet Wilhelm was on of the first people to reach out from outside CT to ask what he could do to help. Piet coming to CT was instrumental in the creation of Blackbelts for Butterflies. Robert Defranco was also one of the first black belts to come to our state in our time of need. Holding autism close to his heart and wanting to do more he came for our first charity seminar and has returned several times to CT.